You remember “ TBird350 ” means the Thunderbird which was introduced in 2000 . The Thunderbird has built for itself a reputation of being a comfortable touring motorcycle and is often the first choice amongst the Royal Enfield models for touring enthusiasts. . The Thunderbird has earned itself the reputation of a capable highway tourer and established itself firmly in the cruiser market. 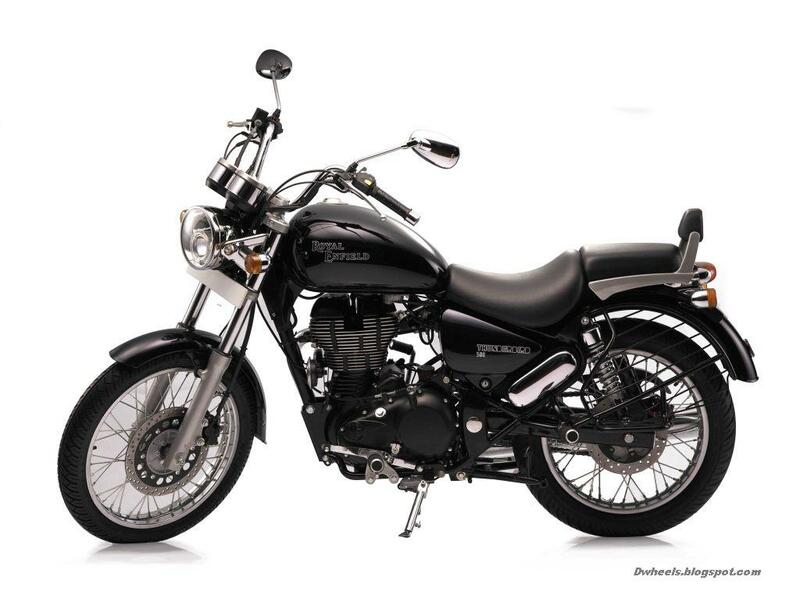 In 2012 Auto Expo Delhi the Royal Enfield has unveiled it s NEW THUNDERBIRD 500 with new looks and changes. The ‘black’ engine is one of the first styling elements that catch your attention the moment you see the motorcycle. The seat has been completely redesigned to suit the new foot pegs position. The handle bar too has received changes for better reach and ergonomics. The seat now opens using a lock mechanism, accessible through the side panel. True to its design concept as a more touring friendly motorcycle, the separately mounted pillion seat can be removed to accommodate luggage. The pillion grab rail is an all new pressure die cast component and lends to the modern design of the motorcycle. Bungee hooks provide the much needed bungee points to tie luggage. Other small styling elements that a keen enthusiast will notice are the Royal Enfield logo on the all new foot-pegs, new design mirrors and the LED tail lamp. The new front end lends itself nicely to the muscular stance of the bike. The instrumentation also includes two digital trip meters, allowing riders to keep a track of total trip mileage as well as intermediate mileage between tankfuls. The speed and engine rpm are shown via tastefully designed analogue clocks, housed in all new twin pods at the front. The main ignition lock also functions as a central steering lock. The inclusion of hazard lamps in the switch gear is a first for a motorcycle manufactured in India. The tank cap is placed asymmetrically on the top right hand side of the tank, instead of the conventional central mounting; a distinctive styling element of the Thunderbird 500. The Black engine of thunderbird having single cylinder Twin spark plug and 499cc engine displacement .It get Max power 27.2 bhp @ 5250 rpm and Max torque 41.3 Nm @ 4000 rpm . Ignition Systemof Tbird 500 is Digital Electronic Ignition and 5 speed gear . Now the Thunderbird 500 come with Front and rear Disc Brake. It now comes loaded with a 500cc Unit Construction Engine (UCE) and additional power makes covering distance an easier task. The seamless torque delivery will keep the rider entertained through the twisty sections. A flick of the right wrist is all it takes now to overtake a slower moving vehicle or climb up a twisty section. When it was time to build a Thunderbird 500, Royal Enfield decided that it had to offer more than what customers were used to seeing from the Thunderbird in its current guise. Apart from the larger engine, the bike now features 41mm thick forks in front and an oval section swingarm at the rear to allow the rider to handle the additional power. The inclusion of a rear disc brake will now allow the rider to confidently explore the upper limits of the motorcycle’s performance capabilities. The ergonomics are now oriented to the cruiser character of the motorcycle. The seat has been completely redesigned to suit the new foot pegs position. The handle bar too has received changes for better reach and ergonomics. The seat now opens using a lock mechanism, accessible through the side panel. True to its design concept as a more touring friendly motorcycle, the separately mounted pillion seat can be removed to accommodate luggage. The pillion grab rail is an all new pressure die cast component and lends to the modern design of the motorcycle. Bungee hooks provide the much needed bungee points to tie luggage. Night time visibility has been the biggest challenge faced by most motorcyclists while cruising on the highway hence the new headlight with a 55w projector lamp for its low beam and a 55W halogen bulb for the high beam addresses that issue. The lighting is at its brightest with the high beam on, working in combination with the projector lamp giving ample spread and penetration on the road. The high rise handlebars, forward placed foot-pegs and a low seat height enable a rider to cover distances comfortably for longer periods of time. But what a waste it would be if the rider had to stop frequently for fuel and for exactly this reason the Thunderbird 500 features a large twenty liters fuel tank for an enhanced range. Stopping power has been aided with the addition of a disc brake at the rear. The braking system is supplied by Bybre, a fully owned subsidiary of Brembo. It is mounted on the new improved oval section swing arm. These changes will enhance the riding experience of the motorcycle on the highway. The Thunderbird 500 comes as a fresh, completely new design. The test mules have been put through intensive endurance cycles, giving the development team constant feedback. It has been a hectic last twelve months at Royal Enfield with the design, product development and other teams working on extremely tight deadlines and targets to give shape to this motorcycle. Available with the motorcycle, will also be a range of accessories available for both rider and machine. The rider accessories include jackets, boots, clothing and eyewear. They will be on display at the Auto Expo 2012. The Thunderbird 500 will redefine the levels of performance offered by a cruiser in India, just like the first Thunderbird 350 did. It will have the ability to cover distances comfortably yet retaining its practicality for regular use. See you on the highway! .